He's no longer just rumored to be lurking in the code. 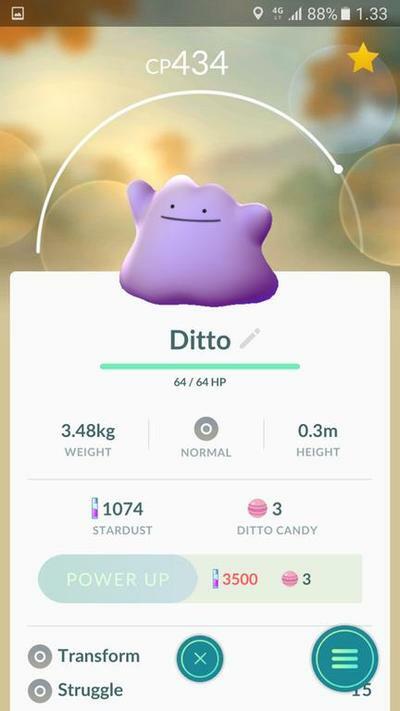 The evasive Ditto is now available out in the wilds of Pokémon GO ready to be caught, bringing us one step closer to a full 151 Pokédex. Ditto is available in all regions with stories popping up from every part of the globe. However, you won't find his character model on the map or in the Nearby menu. Instead, he will appear as a low-level Pidgey, Zubat, or Rattata, and after it is caught, it will reveal its true form! In other words, catch everything you see! That's already not a bad idea either since his launch coincides with the most recent Thanksgiving event, and all Pokémon are giving out double experience points and Stardust. Be vigilant in looking for him. Who knows, this might be a timed event only! Now that Ditto is in Pokémon GO, only Mew, Mewtwo, Moltres, Zapdos, and Articuno are missing from the original 151. All of them are legendary, so don't expect to find them by randomly walking.